Recently, we spoke to Urban radio specialist and media advisor, Harry Lyles, about the radio stations he consults and his process in improving the on-air product. Though, much has changed in the radio business, much stays the same. 1. Harry, you’ve been consulting radio stations for many years. When you start working with a low rated station, what are the elements you look at first? First thing we do is find out why the ratings are low and discuss how to correct the problem. Radio has always been about adjusting because things never stay the same. We help the client decide what to keep, what needs to be fixed and what can be tried to enhance the station's local impact. Playing the hits with relevant on-air personalities engages your listeners and increases your ratings. 2. What pitfalls do you see programmers getting into most often? The main pitfall is not doing self-reflection based on what the locals want. All formats must have a clear description of how it intends to compete and win. Programmers must realize they are responsible for what comes out of the speakers. Winning PD’s study and learn what’s happening locally, what’s not happening, and what must and should be happening. Radio is going through some changes, but updating, adjusting and checking the station for perfection every day is the job. Continuous improvement is always part of any format. 3. With downloads and streaming, there has never been more competition for terrestrial radio. How do you compete? Nothing to be concerned about if the overall programming game is together and tight. Let’s not forget only the listener’s opinion counts. With that, research is your secret weapon for playing the music the listeners want to hear. I’m a strong believer that radio has got to get back to having fun with real personalities. What do I mean? Having personalities that don’t sound like mechanical robots saying the same thing every day and every talk break. Redundant talk breaks are not the recipe for a successful radio product. Stations that win have communicators that are powerful and influence the market. They provide relevant and entertaining content directed to the target listeners. Collectively, to do that, everyone on-air must do their homework every day. 4. You are known as being very conservative in selecting music. How do you determine when to add new music to the rotations? C’mon, this is a simple process. I was taught this years ago and it works today. Yes, it is essential you play hit music the listeners want. In all my years being first on a record has nothing to do with winning the ratings in Nielsen. Why not just play what the local audience knows and likes, and you will be surprised at the results. When you study habits, local music taste and what the listeners really want, being worried about being first on a record, is not a hard decision at all. Just play the hits. 5. With budgets shrinking and managers under pressure for revenue, how do you work with stations to improve their bottom line? Success starts with people at all levels in the building. If you’re striving for the best performance, it does take money to make money. I focus on teaching, coaching and encouraging my client stations to do the best radio possible every day, and if they do, ratings and the revenue will follow. In any business, you can’t survive and flourish without the human factor and striving for consistent growth. Growth generates new revenue opportunities. Having a great company is about creating the right mindset that will help the station grow, and the individuals as well. In today’s competitive environment this may be more important than ever. Collective support, working in house together with a great team, with everyone on the same page, making every moment count is what wins the Nielsen ratings and the financial success of your operation. 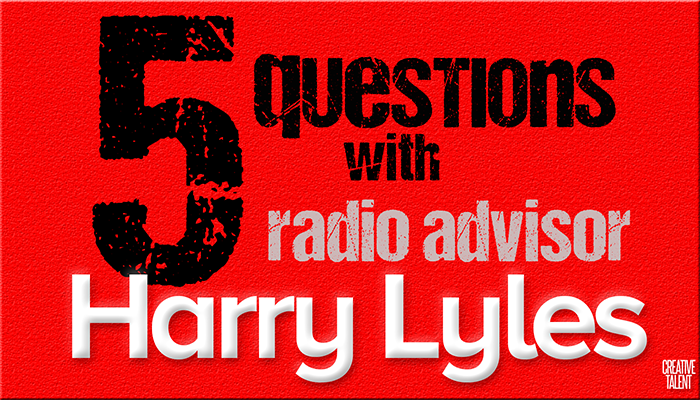 Harry Lyles is a career broadcaster and media advisor for the past 20+ years. He has programmed AC, Classic Rock and is considered the foremost expert in all forms of Urban music radio. Harry’s twelve music channels, urbanradio.com, are among the most listened to worldwide.